Well, I just came back from a whirlwind Walt Disney World vacation where I wanted to get some of that Christmas spirit before the busy holiday season. (When I knew I the parks and resort overall would be exceptionally busy.) I had a fantastic time and enjoyed the new Sunset Seasons Greetings shows, the additions to the Epcot Festival of Holidays, and more. One park that doesn’t get a lot of holiday mentions is Disney’s Animal Kingdom. While the park has some holiday decor, (including a fabulous tree with masks of animals as decor), there isn’t a special holiday offering here, unlike the other three parks. Which makes me a little sad. 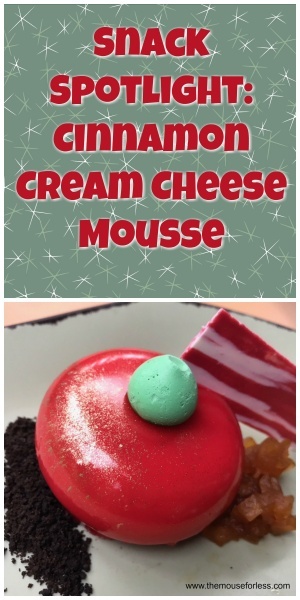 I was also curious to find out if they celebrated Christmas on Pandora and while it doesn’t appear that they do, at least this year, due to the lack of decorations, they did recently introduce a brand new holiday themed treat that as soon as I saw it listed on the menu for Satu’li Canteen, I knew I had to try. 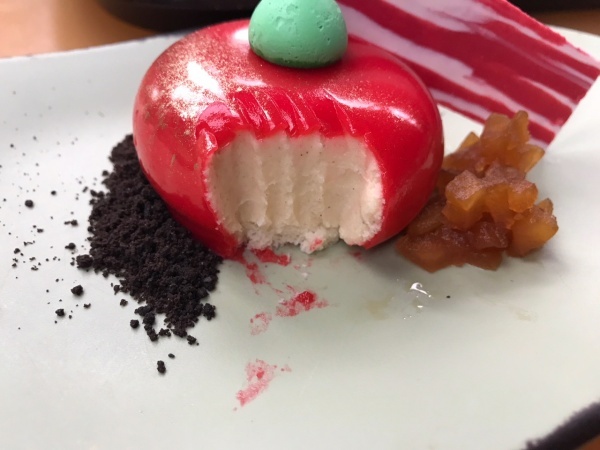 Called the Cinnamon Cream Cheese Mousse, this dish consists of Cinnamon Cream Cheese Mousse, Apple Compote and Chocolate Cookie Crumbles. I ordered my meal through the mobile ordering system, so I had no idea what I was in for! When I received it, the first thing I noticed its bright red color! The dessert is coated in a red glaze. 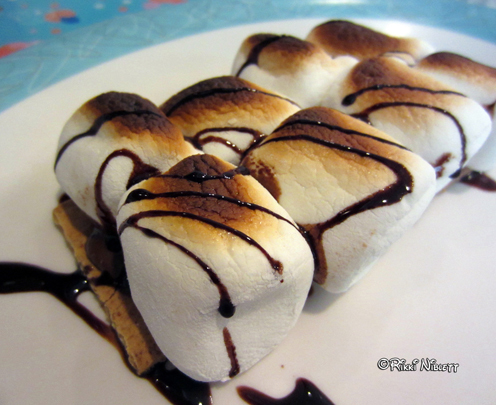 This seems to be a common trend lately with Disney desserts. Many of them are created now with this similar type of glaze. It must be the “it” thing. It’s also served with a white chocolate piece and a green meringue kiss. Once I dug into the dish, I noticed that it was definitely creamy! It had a faint flavoring of cinnamon to it that was quite delicious. I thought the cinnamon apples were a nice addition to the dessert, however the cookie crumbles didn’t really add much. I particularly liked that the dish wasn’t overly rich. I thought this was a pleasant and satisfying dessert. 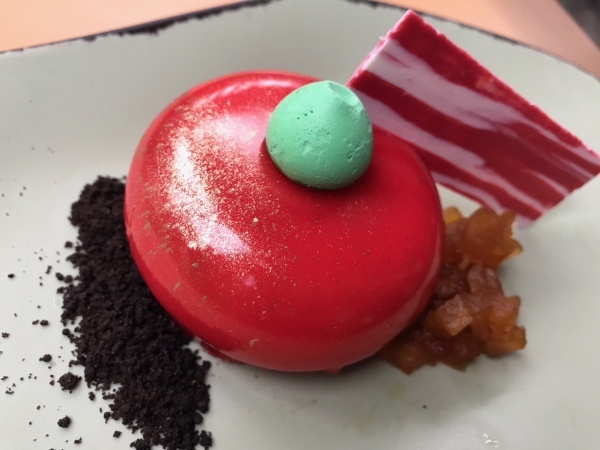 While it isn’t a stand out, if you are headed to one of the restaurants that offers it (in addition to being offered at Satu’li Canteen, it is also offered at Flame Tree Barbecue and Pizzafari), I would strongly suggest picking it up. What is your favorite seasonal dessert? Share in the comments section.